Want a smooth ride for a scenic drive? Try one of our sleek, stylish highway trailers. Our range of trailers offers something for everyone and can accommodate a variety of tow vehicles. The Trek is the ideal choice for teardroppers who want a perfect blend of size and convenience. It’s based on our 5’ x 8’ fully boxed steel frame. If equipped with a 72” mattress, the galley fits all the standard cabinets available on our larger teardrops. With a fairly moderate tow weight, the Trek is easily pulled by Subarus and other mid-size sedans and wagons. The Sojourn is our most popular teardrop. Its slightly larger size combines convenience with lots of storage and ample galley room. It begins with a 2x3 fully boxed steel frame for extreme durability. With a slightly heavier dry weight than the Trek, the Sojourn can be towed by mid-size sedans, vans, and trucks. The Sojourn’s additional space allows for even more configuration options for the galley. The Cruiser is big enough for a queen mattress and offers up to an extra foot of space. The front end design offers more room for you and all the comforts of home. In the galley, there’s plenty of space to install all our options, such as a Dometic refrigerator and a Propex heater. The tongue has an extra foot of space, and our new TeardropsNW tongue box is standard. Trailers in photos may be equipped with additional features beyond our standard packages. 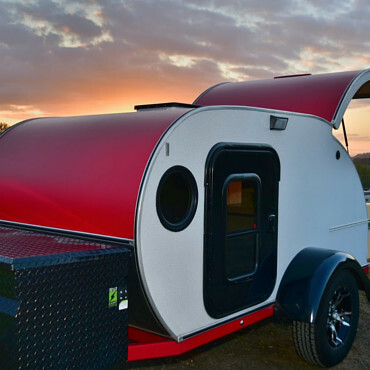 Ask us about customizing your trailer with some of these great options!